This article is about the final area in Super Mario RPG: Legend of the Seven Stars, sometimes referred as the Gate. For the seventh world in Donkey Kong Country Returns called Factory, see Factory (Donkey Kong Country Returns). For the obstacle in Mario Party 4 called Gate, see Gate (Mario Party 4). For the location in Super Mario Galaxy called gate, see Gate (Super Mario Galaxy). 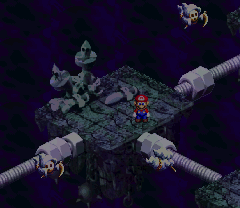 The Factory (also known as Smithy Factory and called Gate on the overworld map) is the gloomy dimension where Smithy and his cohorts resided in Super Mario RPG: Legend of the Seven Stars. The entire factory is filled with Smithy's Machine Made weapons and the assembly lines that carry them. The factory's design greatly resembles the Airships of Super Mario Bros. 3, including the Bolt Lifts sometimes utilized to reach far platforms and the fog that fills the air. Smithy's Factory also refers to World 7. 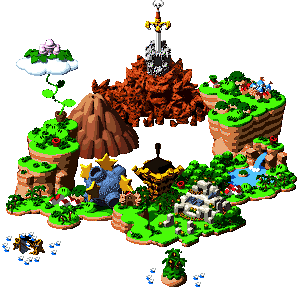 This region includes the Factory dimension as well as the gateway to Mario's dimension, in this case, the Smithy Gang occupied Bowser's Keep and Vista Hill. After defeating a Machine Made Yaridovich, a Brick Block explodes to open a passage deeper underground. This leads Mario and company directly to a boss battle against Cloaker and Domino and their pet snake (either Mad Adder or Earth Link, depending on which of the bosses is left standing). The inner part of the factory is seemingly made of all steel. To the right, in each room, Mario can witness the process of a Jabit being manufactured. According to a Shyster, the foundations for the floor Smithy was operating on had only been applied the day prior to Mario and his party's arrival. The music has an unusual time signature of 13/8 (13 quavers [eighth notes] to a bar [measure]). The Factory is actually referred on the world map as "Gate", but it is called "Factory" on the save point. Despite the management staff consisting of 4 boss fights, only Gunyolk and the Factory Chief have boss music. The Clerk, Manager, and Director have regular enemy music. ↑ 1.0 1.1 Super Mario RPG: Legend of the Seven Stars Nintendo Player's Guide, pg. 5. This page was last edited on March 30, 2018, at 21:46.